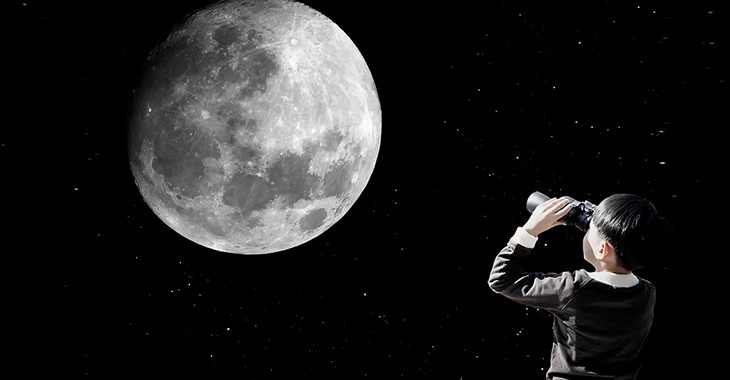 The one typical intention behind binoculars (viewing distant objects) has already come out of its cocoon and spread toward all directions of outdoor recreation. With that in head, I’m going to describe the types one by one in this article. I need to clarify one thing: the ‘actual’ types of binoculars. In my opinion, the types aren’t hard and fast. The only thing that we can do is consider the binoculars from different angles, test how they perform on those areas, and finally categorize all those thoughts into uniformity, so enthusiasts can make decisions in the light of the findings. Hold on for a few more minutes, please. Allow me to explain some fundamentals before starting to talk about the types. It’s a quick overview of a few essential terms, but I promise it’ll be worth your time. Since the core of my discussion will be based on these terms, I’m providing only a primer. For details on these terms and more like them, you may read another article written by my fellow, my favorite partner, Robert Townsend. Binoculars consist of two objective lenses placed like one at each end. These lenses collect light from the user’s target. They bring the accumulated light into focus in the binocular’s eyepiece lens. All these mechanisms result in a magnified image that is positioned backwards and stay upside down. Prisms are the components that correct the image’s ‘orientation’ issue being located between the eyepiece and the objective lens. Prisms are originally glasses (also like mirrors) that rely on internal reflections for bringing the light beam from the objective lens close, and thus correct the image orientation. 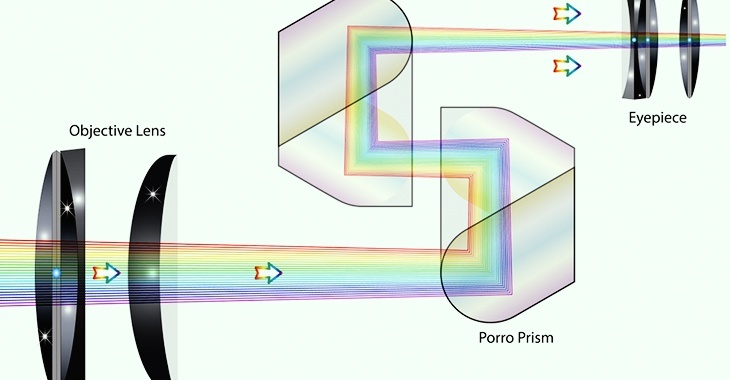 So far, binocular manufacturers have used two prism types, such as porro prisms and roof prisms. I’ll talk about them in the next section of this article. The understanding of how binocular works starts with the education on these two terms (numbers actually). Magnification is the optical process that enlarges the apparent (not physical) size of the object being visualized. This enlarged visualization is expressed by a number which we call magnification. Look at your binoculars. Maybe, it’s 7×50, for example. The first number is the magnification. The second number is the objective lens diameter in millimeters. These numbers express the amount that your binoculars can gather. So, you know what matters and what doesn’t. Now, let’s get into the types. It’s safe to call this type, prism binoculars. 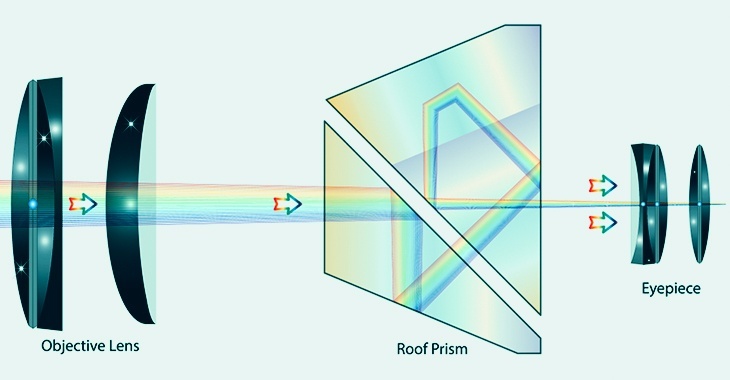 Here’s a concise yet practically justified discussion on the both prism types. Consisting of four prisms including two for each side, these binoculars create an erect, visible image using two prisms. In this design, the objective lenses and the eyepieces stay offset, meaning that the objective lenses aren’t aligned with the ocular lens. These binoculars are favored by those who are fond of stereoscopic images (the ones with depth and solidity). Popularly known as Dach, these prisms come in the shape of a typical roof. One of the prisms has a surface that barely features total internal reflection. As a result, the system suffers from losing some light. However, some coatings can be used on that surface, so the ‘reflectivity’ can be augmented or raised. This design dictates that the prisms stay aligned with each other forming a straight line. The same thing happens to the eyepieces and objective lenses. So, the optical path remains straight resulting in the preferable ‘compact models’. Confusions as to which one to pick is nothing new as choosing one particular model sometimes becomes tricky for even seasoned users. So, I’m putting a table to show you the comparison between the two prisms and their applications and quality. In fact, this category doesn’t indicate what you call a type of binoculars. But, I would like to label them as a distinct type for good reasons. The focus systems of binoculars work differently. While most outdoorsmen wouldn’t emphasize much on this, I tell you what; they’re important just as the other aspects of binoculars. 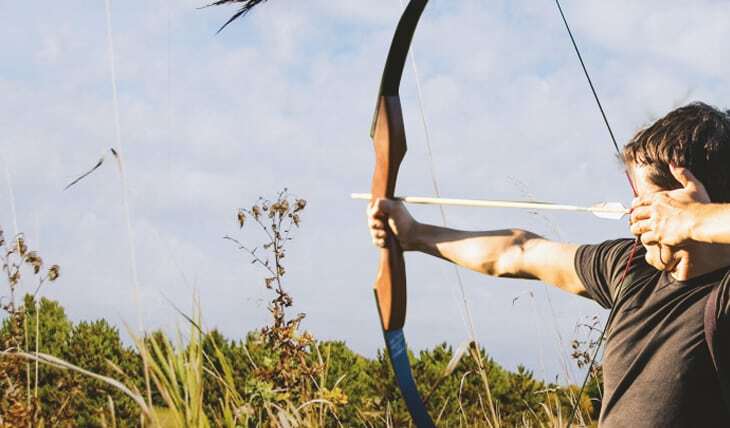 Incorporating a single focusing wheel, these models focus on the targets, no matter if it’s close or far away. So, I love this type more than the following two systems. You can focus each of the eyepieces for looking at the target. 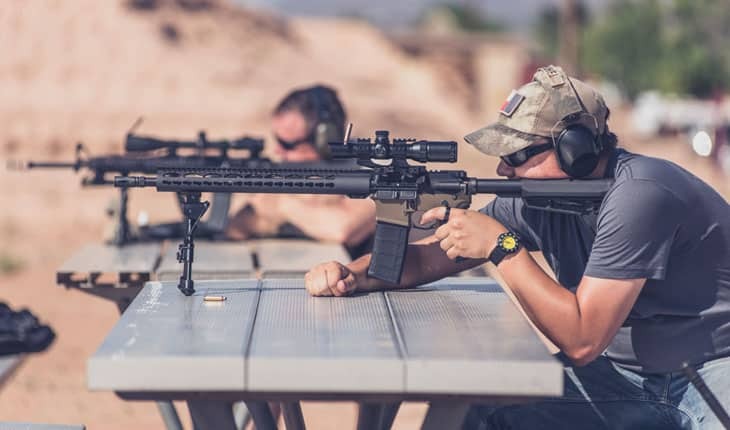 The good thing is that you need no additional focus if your eyes got one because the target remains in your focus; no matter where it is, within 40 yards or more yards away. Ideal for astronomy purposes and marine settings, these binoculars are also great for both medium and long-range shooting. In this type, the eyepieces remain locked and aren’t adjustable. 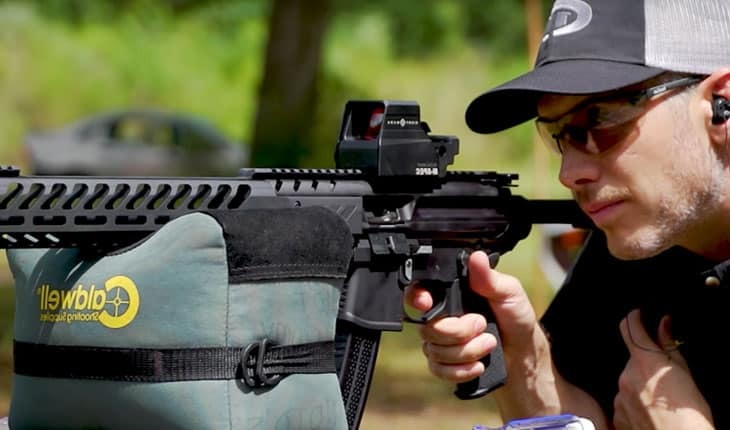 So, with this type, it’s not possible to focus on a target any closer than 35-40 yards away. You needn’t spend much on these units, but the limitation (zero adjustability) may affect your ocular dominance. If you love to watch fast-moving sequences, binoculars with wide angles prove to be more useful than all others. These devices allow the user to track each moment efficiently. Some call this type, an all-in-one innovation. 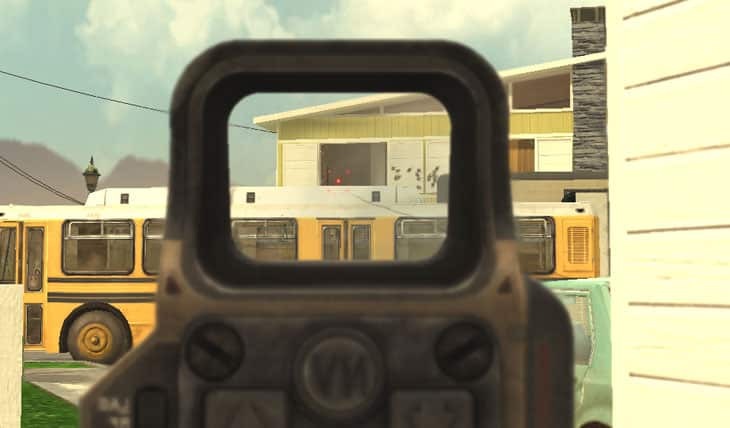 Although I don’t hold it with much attention, it lets the user increase/decrease the magnification to set the focus on the target appropriately. The different applications of binoculars don’t necessarily classify them in general. It’s just all about their usability for different groups of users. Now, I’m describing how many ways manufacturers keep in mind while making modern binoculars. All the superlative degrees go with these binos. Largest in size…heaviest in weight…highest magnification level…largest objective lenses! These best describe astronomy binoculars. A rugged design and superb light-transmission system are the chief features. These models are designed to perform well in low-light surroundings. These units are known to be the ‘compact’ models designed to consume a little space while meeting the demands of instant usability. Travel binos may not perform very well in low-light settings. Marine devices have to be waterproof, fogproof, and able to withstand environmental impacts and daily wear and tear more than all other types above. A typical marine pair comes in armored housing with non-slip rubber surface. Light-transmission properties of this type are far better than most others, and the sharpness of optics is above standard too with the magnification being a standard level. Low magnification power and the ultralight weight design are the recognizable features of this type. These devices are intended for indoor uses. I’ve categorized these binoculars considering their construction and other features. Do I have to remind you that these aren’t conventionally types of binoculars? Well, let’s know about them. These binos usually come nitrogen purged and O-ring sealed so that they can withstand natural impacts and elements and serve under various weather circumstances. Housed in rubber or synthetic casing, this type withstands scratches, day-to-day wear (normal), dust, etc. I found one (bought three years ago) of these pairs to be very handy. Now that I’ve explained the available variations, I hope you’ve already got your questions regarding the different types of binoculars answered with expandable details. But, I won’t mind receiving further questions from you on the topic. Hey pal, I love to write and share, and that’ll be my pleasure if my suggestions really become a help!